As seen on TV! $385 Flat Fee. 2-3 Hour Event. We provide everything. Just come by yourself to explore the sport, or bring the whole family or group! We've hosted the Travel Channel, Discovery Channel & even Queen Latifah with this event! A truly unique experience in an incredible location for low, slow & safe flying in a state-of-the-art Light Sport Aircraft. This event is a full morning or evening dedicated to you - or your group. Lasting from 2-3 hours as weather permits, this is a great opportunity to explore the terrain, sky & sport in general while receiving one-on-one attention both on the ground and in the air. While safety is our #1 concern, the terrain frequently opens up & offers opportunities to get down low (sometimes only a few feet off the ground) and see it all as we cruise about 45mph over the blooming vegetation, wildlife, streams, lakes & the whole ecosystem - everything up close while we leave no tracks! Most of our flights finish with a trip up to altitude over the landing area to shut the engine off & glide home. Since the trike is a glider before it is anything else - why not take advantage of it?! As the engine shuts down & everything goes quiet, you'll feel the inherent stability of the craft and enjoy a 10 to 1 glide ratio in the silence and altitude only appreciated by the birds! You'll simply never look at the sky the same, we promise. Email Us if you are interested in scheduling an Evening Of Flight. Bring Friends & Family - or Group Dynamics & Team Building! Anniversary? Birthday Party? Special Event? Bring a group!This is a great opportunity for groups who may not have a direct intention to join the sport, but would like to discover Light Sport Aviation & get some air under their wings as something new & different to do as a family or group. All flights have instructional elements but only as much as you're interested in! 2 - 3 Hours Dedicated to You. We obviously tailor the event to meet the interest of the individual or group. However, we do offer Equipment Orientations & Intro to the Sport, Unlimited Flight(s), and offer one-on-one Question & Answer sessions. No schedule - just whatever & however you want the experience. 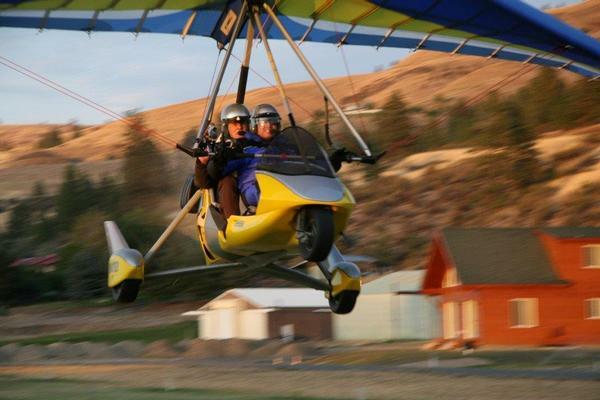 Included in your cost is a Membership Fee that makes you a member of the TrikeSchool Flying Club! Your flight counts as a lesson toward your certification! With only 15 hours of instruction required, you'll be on your way. Flying For All Ages & Interest Levels. We can tailor the event for a wide range of ages. We've flown people between the ages of 6 to 106. The only requirement is that the safety equipment must fit; so just give us a call & we'll discuss. Absolutely EVERY flight has an instructional nature. All of our fleet aircraft are equipped for instruction so that you can fly the aircraft fromt the passenger seat. You are welcome to fly the whole time if you like - and the weather is friendly! We are conservative pilots/instructors and have one of the best safety records in the world. Our aircraft are typically 2 years old or newer, cost over $85,000 each, have certified 4-stroke engines, carbon fairings, nitrogen suspension, heated seats, full instrumentation, VHF communications, primary & secondary GPS systems, oxygen, life preservers, fire extinguishers AND are uniquely fitted with ballistic parachutes designed to save the entire aircraft & crew. Our planes are also gliders before they are anything else. They are capable of landing with less speed (35mph) & distance required (200 feet) than 97% of other aircraft. However, NO amount of diligence, maintenance & experience can eliminate ALL risk of injury or death. It can happen. We have no interest in hurting ourselves, nor our equipment & consequently not you either. But, YOU will be taking a risk both on the ground & above it. And, you WILL BE releasing us and our company from any and ALL liability for your decision to participate. It is only under these conditions that we are willing to share this experience with the public. Aircraft, routes & time aloft may vary with weather, conditions, size & health of the client; and of course, availability.